Download the latest version of the Makelangelo software. The Makelangelo software is the heart of the machine. It does all the heavy lifting. The very first Makelangelo robot was “hard coded” to run a few simple lines. Then it was taught to understand gcode, the language of manufacturing CNC robots like 3D printers. That was a big improvement, but someone still had to sit there and type all the gcode into the robot, one line at a time. 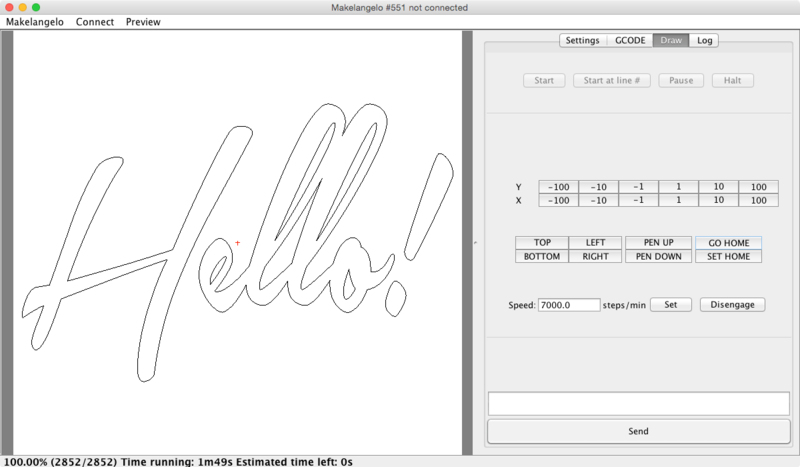 We built the first Makelangelo app to deliver thousands of lines of gcode for us, as fast as the robot could draw. …but turning a picture into gcode instructions took three apps and 40 minutes. So we streamlined the process into one app and now it’s a few simple clicks to transform your JPEG, PNG, BMP, GIF, or DXF into gcode and start drawing. The Makelangelo software is Open Source. Copyright © 2019 The Makelangelo Art Robot. All rights reserved.